Queen + Adam Lambert shook up the Main Stage alongside local heroes Texas and The Temperance Movement, as Scottish acts were the hot topic on day 4 of TRNSMT. The Temperance Movement brought the good times and amazing atmosphere to the Main Stage as weekend two got off to a flying start in the sunshine. Their bluesy rock ‘n’ roll, and outstanding showmanship of their incredible frontman, Phil Campbell, went down a storm with the hometown crowd with tunes including ‘Built-In Forgetter’ and ‘Only Friend’, an ideal homecoming after a globe-trotting tour. 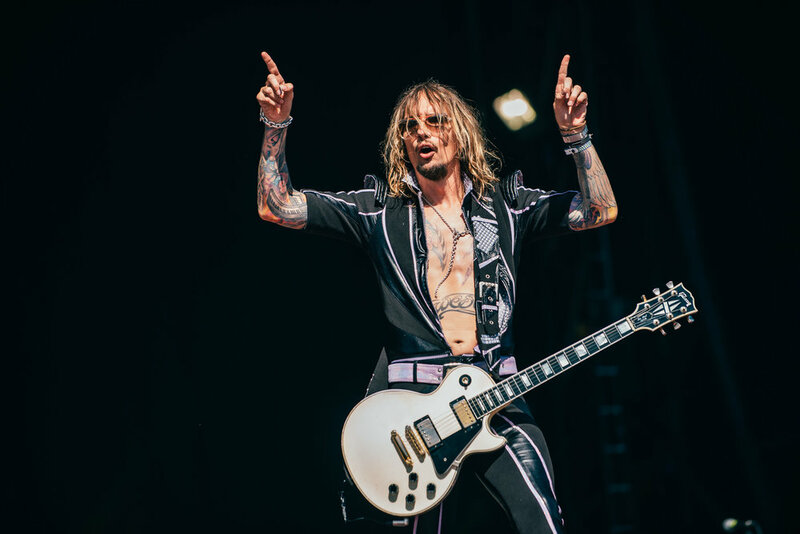 The Darkness were up next and unleashed their glam rock party on the TRNSMT crowd. They sashayed and swayed across the Main Stage, ending with mega tune, ‘I Believe in a Thing Called Love’. Festival veterans Alabama 3, with a live career spanning twenty years and countless appearances in Scotland, certainly have not lost any of their appeal as the crowds flocked to the Main Stage for their mid-afternoon set. As the slow and steady beat of ‘I Woke Up This Morning’ echoed out across Glasgow Green, the band made way for one of Scotland’s biggest exports, Texas. Meanwhile backstage, Paolo Nutini basked in the summer sunshine catching some rays and some good times ahead of headliners Queen + Adam Lamberttaking to the stage. And what a stage it was. Created by STUFISH, the stage is based on Brian May’s custom-made guitar which was designed and made with his father in the 1960s. Black gloss with a red chrome edge, it was incredible, measuring 21m wide and 34m long. The stage allows the band to be surrounded by more audience than ever before! Over at the King Tut’s Stage Powered by Utilita, Scottish bands stole the show all day long. With all-female rockers The Amorettes starting strong, and loud, they were followed by acts such as Mason Hill and Hunter & The Bear. Later in the day, The Xcerts, a shining light of the Scottish music scene for the last ten years, brought a set that included old fan favourites and songs from their latest album ‘Hold onto Your Heart’. Headlining the King Tut’s Stage Powered by Utilita was GUN, the Glasgow hard-rockers who first stepped on stage thirty years ago showed that over time they, along with their hit singles, have not aged, and they’re still as youthful, loud and enjoyable as ever. Back over on the Main Stage, the Scottish bands just kept on coming as Texas played to their beloved Glasgow audience, with a set that encompassed all that is great about their universally-appealing pop-rock sound. ‘Summer Son’ and ‘Say What You Want’ were undeniable highlights, as these huge hits raised the voices of the thousands of fans who poured into Glasgow Green for another weekend of live music. Sharleen Spiteri kicked off their set by announcing “Glasgow, we’re home!” and, not wanting the set to finish, treated the TRNSMTaudience to a cover of ‘Suspicious Minds’ to finish off a resoundingly successful homecoming for these Glasgow giants. Festival vibes continued to sweep around the sunny site with temperatures rising and fans were treated to the perfect chill out zone by the river with Hotels.com. There was also more incredible food on offer today from PLATFORM serving up delicious treats for festival goers, with everything from vegan to vegetarian, pizzas to pits and beyond! A few new editions for weekend two included the TRANSMISSION Bar and the much loved festival staple, the big wheel giving incredible birds eye views of the site. Whether those in the crowd had followed tonight’s headliners throughout their musical career, or it was their first time witnessing the sheer power of that back catalogue, as Queen + Adam Lambert took to the TRNSMT stage there was a certain kind of magic in the air tonight. Their setlist included everything the crowd were anticipating from their headline set: showmanship, back to back Queen classics and a truly explosive, once in a lifetime show. Providing the crowd with a truly unforgettable moment, Brian May expertly guided the Glasgow crowd through a rendition of the Scottish anthem ‘The Bonnie Bonnie Banks o’ Loch Lomond’, paying tribute to his own Scottish mother. ‘I Want to Break Free’, ‘Radio Ga Ga’, ‘Bohemian Rhapsody’, ‘We Will Rock You’…just some of the EPIC tunes on offer as the sun set on a glorious Friday night in Glasgow. The TRNSMT crowd needed Somebody to Love and boy, did the band deliver. From Brian May taking a selfie with the expansive TRNSMTcrowd, to a poignant tribute to Freddie Mercury from fellow frontman Adam Lambert, mass singalongs to ‘Under Pressure’ and the promise by Adam Lambert to spend a night truly celebrating the biggest rock band in the world – TRNSMT’s Friday night was one for the history books. And now, time to wait until Sunday, as another TRNSMT Festival draws to a triumphant close with highlights of the final day of TRNSMT 2018 sure to be a headline set from The Killers and homecoming crowds for Scottish giants CHVRCHES, Franz Ferdinand and so much more.